Those iOS 6 maps - Step 2 is the hard part. I waited a week after iOS 6 was released, asked my Facebook friends what they thought of it, and within hours got 6 responses that all said not to upgrade if I care about maps. Well, I do care about maps, but how bad can it be? I wanted to see for myself, but not shoot myself in the foot on the phone I depend on daily, so I upgraded my iPad instead. Actually, the new 3D view is very cool where the data is good, and here in San Francisco the data is good. Zooming around my neighborhood is fun and looks great; that’s a real win. In fact the maps overall look great, and the zooming is much smoother than what we’re used to with the Google-powered maps in previous versions of iOS. How about the underlying data? Um, not so good. Roads are (in my experience) where they belong, but addresses and landmarks and businesses are often not. I don’t know why anyone is surprised by this; it’s a very hard problem, and Google has worked incredibly hard (and thrown a lot of money, human time, and computer time at acquiring and massaging the data) to get their maps to the point we all take for granted now. The world is very big. That doesn’t mean it’s pleasant when I search for an address a mile from where I’m standing and get a search result for a similarly named street 1000 miles away in Texas. That’s what happened to me the first time I tried actually using Maps for real, i.e. to find something whose location I didn’t already know. 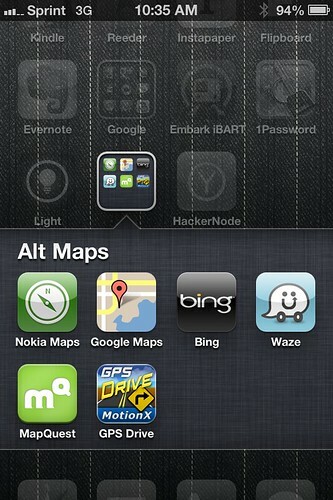 I also tried plugging in a few locations I remember from our trip to Ireland, where iOS 5 maps (i.e. Google maps) got us everywhere we needed to be, and Apple maps didn’t know them; that trip would have been much harder. But luckily, the built-in Maps app powered by Apple’s fledgling data set isn’t your only choice, and that’s what my screen shot above reflects. I tried the various alternatives shown here before upgrading, and came to roughly the same conclusions as this Ars Technica article: Waze is neat for navigation but not a replacement map; MapQuest is pretty unpleasant to use; the Google Maps website actually works just fine; upon confirming that last, I decided it was fine to upgrade. More surprising to me is that it’s Nokia who has the second-best map experience — both data quality and interaction design — after Google. (Maybe I shouldn’t have been surprised. I remember reading about Nokia’s Mobile Millenium project and thinking that while their approach seemed more like academia than industry and Google is probably leaving them in the dust in terms of speed of deploying new features, their very thoughtful approach especially with respect to privacy is commendable. Clearly, they’ve been taking this seriously.) I tried, again, punching in some of the hotels we stayed in in Ireland, which Google could locate and Apple couldn’t, and Nokia found them just fine. That test involves just a few data points, but is in keeping with a general reputation that only Google and Nokia have decent place data outside the US. So the obvious conclusion: Apple should just buy Nokia.